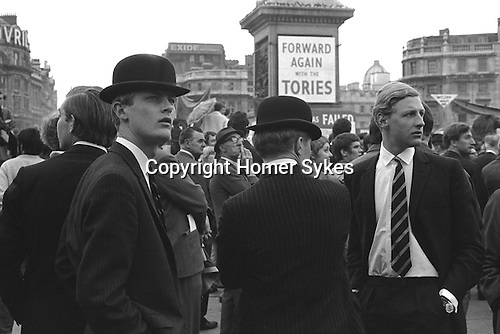 Bowler hatted, suited and wearing their old school ties, four young ‘City Gents’ attend a Conservative Party ‘Forward Again with the Tories’ rally in the run up to the 1970 General Election. Edward Heath won for the Tories with a surprise, but small majority. The Bowler hat had once been popular with the working classes, it was their hat of choice. During the 20th century it became synonymous with upper middle class men who worked in the City of London. By the middle of the 1980’s it had all but disappeared.